Helen Frankenthaler (center) on gondola with (clockwise from bottom left) Lady Dufferin and Sheridan Hamilton-Temple-Blackwood, 5th Marquess of Dufferin and Ava, Jules Olitski, gondolier, Anthony Caro, John Kasmin, and Richard Smith, Venice, Italy, 1966. © Reg Lancaster/Hulton Archive/Getty Images. This exhibition is the first presentation of Helen Frankenthaler’s work in Venice since its appearance in 1966 at the American Pavilion of the 33rd Venice Biennale. Covering a forty-year span of Frankenthaler’s career from the early 1950s to her richly atmospheric canvases of the early 1990s, it features fourteen panoramic paintings, all from the collection of the Foundation. Helen Frankenthaler, Western Dream, 1957, oil on unsized, unprimed canvas, 70 x 86 inches (177.8 x 218.4 cm). © 2019 Helen Frankenthaler Foundation, Inc./Artists Rights Society (ARS), New York. The exhibition will explore large-scale abstract painting, sculpture, and assemblage, from the 1940s to the twenty-first century, through works from The Met collection and special loans. The Foundation is lending Western Dream, 1957. 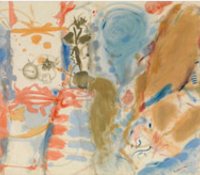 The exhibition highlights Frankenthaler’s exploration of the relationship between landscape and abstraction through key examples of work the artist produced in Provincetown, MA.